The Gisborne Marist and Poverty Bay rugby players, John Collins (left) and Pat Ransley, left Auckland last weekend on a four-week rugby tour of Fiji with the Maori All Blacks. Collins, who plays in the five-eighths position, is 25 years of age, and is the son of Mrs T. Collins, Tokomaru Bay, and the late Mr B. W. Collins. The tour will be his first representation for New Zealand, but he has played for the Commonwealth Services team and the All Malayan rugby team while stationed in Malaya with the New Zealand Army. He also played for North Island in the annual North-South game earlier this month, and scored his team's winning try. Ransley, who plays on the wing, is 24 years of age, and is the son of Mr and Mrs I. R. Ransley, Dalrymple Road. 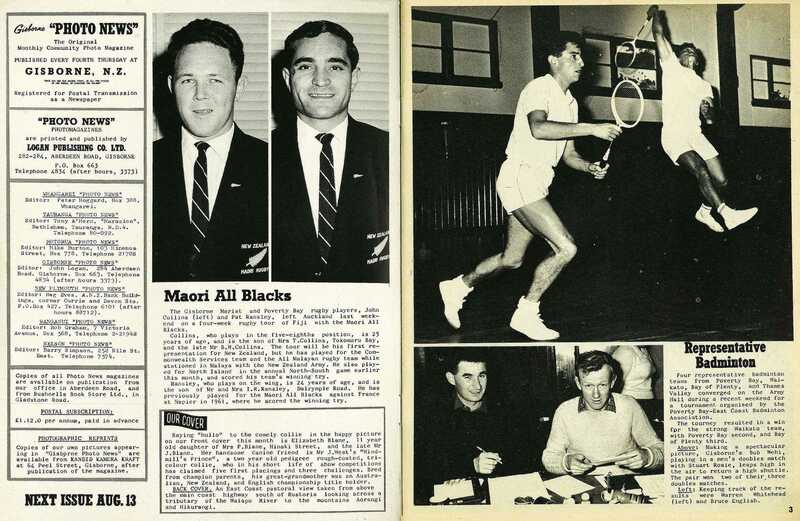 He has previously played for the Maori All Blacks against France at Napier in 1961, where he scored the winning try.